The Jack and Jill windmills are treasured, Grade II-listed Sussex landmarks. Set high on a ridge, they enjoy extraordinary views over both the North and South Downs, and — on a clear day — the sea beyond. But while the smaller Jill was repaired in the Eighties and is now maintained and run by local volunteers, Jack has been variously lived in or abandoned since it was retired from active milling in 1910. Now, thanks to a thoughtful and quietly radical development by Featherstone Young Architects (FYA), this 19th-century mill is part way to restoration, while the two adjacent buildings — a Sixties house and a granary — have been transformed into a unique accommodation complex that connects these three diverse structures through shared materials, vistas and sensibility. The conservation imperative alone might have deterred most clients. The scheme entailed the close involvement of South Downs National Park, English Heritage, SPAB (the Society for the Protection of Ancient Buildings), CPRE and local community groups, that wanted not only to preserve the rights they currently enjoy for visits to Jack, but ultimately see it restored to working order. However, this particular client — Jolyon Maugham QC, director of The Good Law Project and most recently an outspoken advocate of a better Brexit (or none at all) — isn’t one to shirk his civic responsibilities. 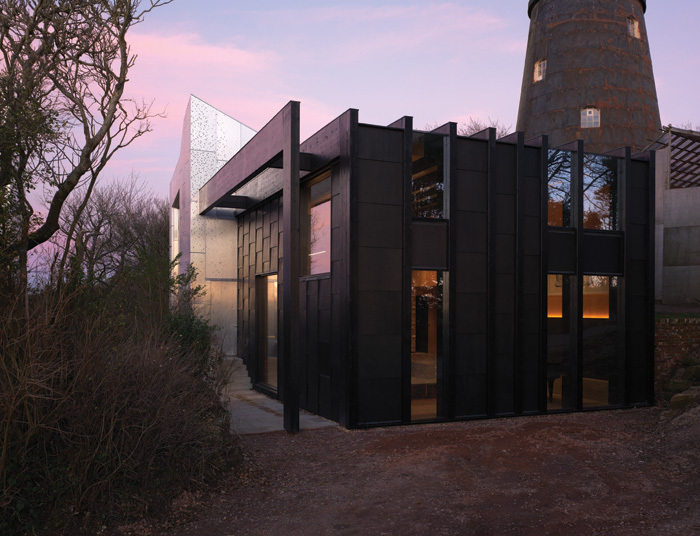 Having admired FYA’s residential work, he and his wife Claire had asked the practice to help find an architecturally interesting site to transform into a home for their family — and Jack Mill is nothing if not interesting. The upside was that the site already had permission for residential development; the downside was that it came with lots of conditions, none of which seemed to deter the Maughams. But not all architects would have taken the time — five years — and care to come up with a solution that accommodates all the stakeholders so gracefully, while creating a scheme that is distinctive, respectful of existing narratives, and exemplary in its husbandry of resources. Rather than single out one of the more unusual buildings for the family home — the mill or granary — FYA focused on the unremarkable Sixties house as main residence, making a few key adjustments to rooms, windows and staircase to provide maximum enjoyment of the location, and adding a seductively simple top-floor lounge via an aluminium-clad ‘pop-up’. A pop-up sibling also appears on the granary. Through these two interventions, FYA was able to create a strong axis through the site, adding large windows that connect Jack to Jill, without disrupting the buildings’ characters. ‘The pop-ups are made using metal in quite a crude way; it’s milled aluminium,’ says Featherstone. ‘We didn’t want anything too slick.’ To protect Jack from the harsher south-westerly winds, its west-facing half is clad in metal panelling, covered in a coating of tar, while the eastern side of the windmill is tarred brick. The pop-ups bring a sculptural flourish to the complex, creating a dynamic profile against the sky. They feature decorative perforations, like bullet-holes arranged in a seedscatter pattern, and will weather to a chalky finish, tying in with the black and white theme that unites all the buildings. White is the traditional colour for moving windmills (where the whole frame rotates on its base, like Jill) while black is the colour for fixed or ‘tower’ windmills, like Jack (where the only moving element is the white cap and sweeps). A bold new structure of tall, black timber glulams crouches, spider-like, over the original wooden frame, with the strong rhythm of the glulam emphasised by alternating double-height glazing, or sections of black-stained panels, which mimic (in scale and dense, tarry colouring) the metal panels on Jack. 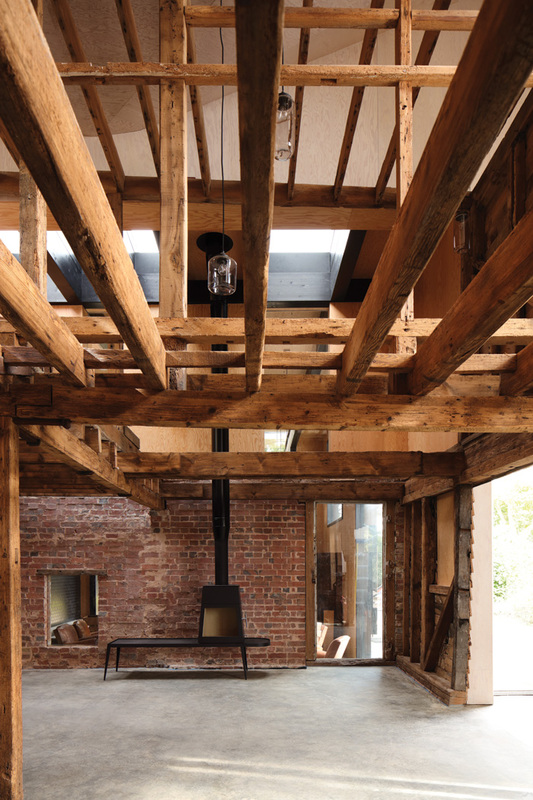 Inside, plywood panels set up a sympathetic counterpoint to the older timbers, wall sections and window apertures. An existing brick wall that once connected the granary to a cart house has been patched up, and now divides the smaller lounge from its larger counterpart, while poured concrete provides a robust, unifying floor surface. Original timber beams and joists exposed within the granary space add an intriguing, ghostly imprint of the earlier building. This multilayered timber aesthetic makes more sense once you step inside Jack — currently part way through restoration. Every ceiling within the mill’s five storeys is a patchwork of wooden beams and boards, alcoves, trapdoors and levers, alerting you to the fact that this handsome structure was once a machine. 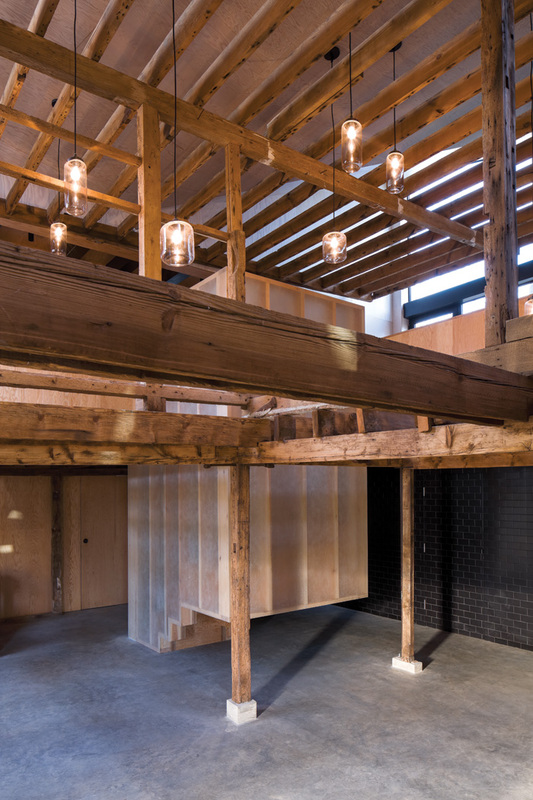 With its distinctive character and generous volumes, the granary, in its current form, is ideal for entertainment in private or public events; it is hoped that the community will use this space for educational and heritage tours and events. But corporate hires are also envisaged, possibly to help raise cash for Jack’s restoration. It is also a charming guest wing, with two bedrooms tucked away along the first-floor walkway of the north elevation, with a bathroom in between. Future residential use has also been factored in, with the space beneath the bedrooms earmarked for a kitchen. A quirky, lightweight staircase has been inserted, sculpted out of timber and studwork, and encased in fibreglass. Lighting strips set into the treads cast the structure into a patchwork of planes and grids, in sympathy with the surrounding structure. It is more than that, however. With FYA’s interventions, the house now expresses all the light and rationalism that the best mid-century houses achieve, combining grace and comfort with a modesty that makes it a perfect foil for the spectacular surroundings. The entrance lobby — tastefully refloored in a herringbone brick tile — now serves as a primer for the main event: the 180-degree views from the first-floor lounge and dining space. In the ground-floor lobby, FYA has inserted full-height glazing into the south-west wall, framing a view of the garden and the lower part of the Jill windmill; three bedrooms and a bathroom are tucked neatly to the left. 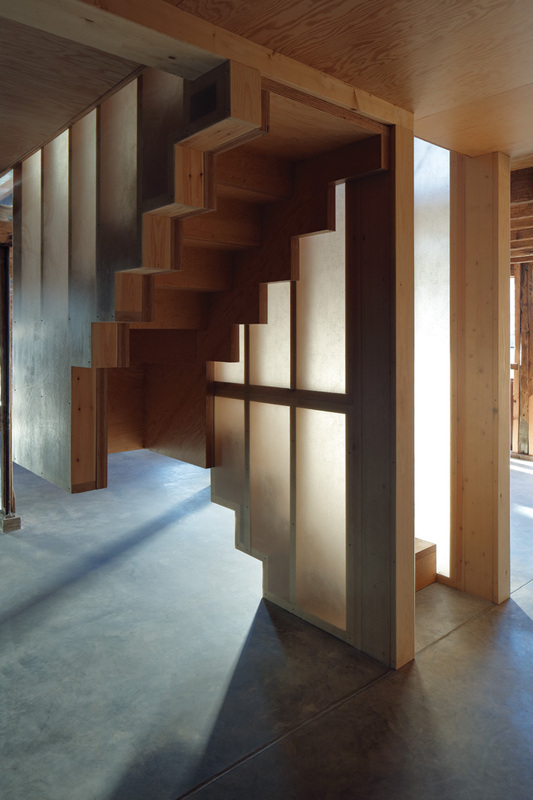 The original staircase has been replaced with a handsome, stylistically sympathetic one, using thick, Iroko wood treads, with the stair’s orientation reversed in order to land at the right point in the newly added top floor. Arriving on the first-floor landing, you get the full connecting views between Jack and Jill. To the left, a cramped kitchen has been removed to achieve a warm and open-plan living space. Large corner windows on the left have been added to match the existing ones on the eastern, living room side. 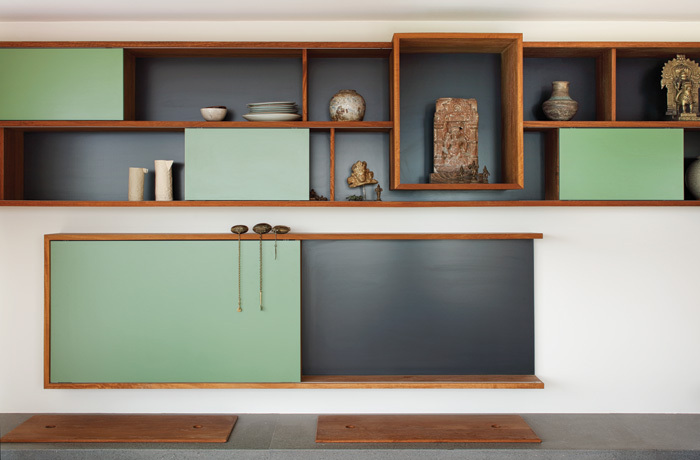 The dominant material is wood: the cupboards and shelving (with touches of classic Fifties sage green), midcentury furniture, generous wooden slab kitchen counter and the original parquet floor. In this way, all attention is thrown on to the panoramic view on three sides. Large glass doors lead to the original raised decking. More infrastructural than inspirational, there was talk of expanding this into a large terrace, but Featherstone again argued for keeping the integrity of this Sixties structure, with its gangway into the landscape. Its simplicity ensures it doesn’t detract from or compete with the house, now back to its authentic timber cladding (which previous occupants had replaced with pvc) albeit lined with a useful layer of 21st-century insulation. Two further bedrooms are stashed behind the first floor living space, and a new bathroom, whose most striking feature is a window veiled by one of the aluminium panels at a point where the ‘seed scatter’ pattern is at its most intense. This perforated, starburst effect is also enjoyed on the opposite, south-west facing side of the pop-up, providing both drama and solar protection. 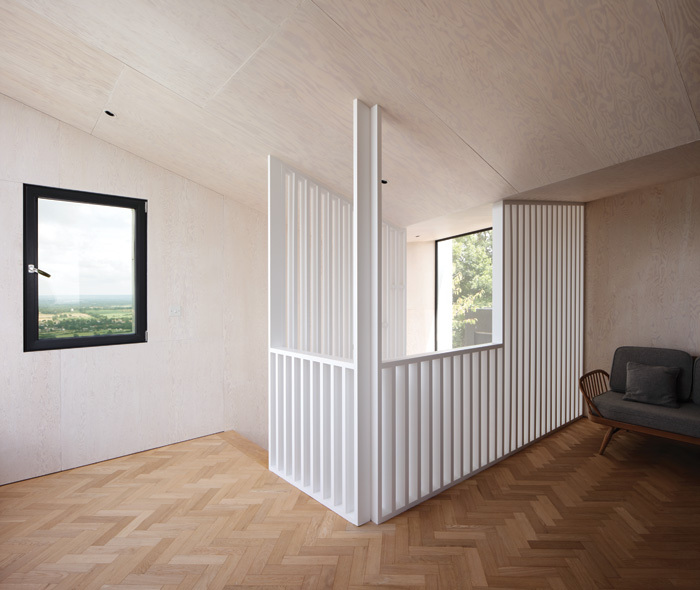 On this top floor new oak parquet references the original flooring below, while its walls are simple plywood panels, with a white wash over them, thus linking their angled planes with the movement of the dynamic roofscape. ‘I like the fact that everything we have tried to do is about simple, robust materials that might be associated with an agricultural building,’ says Featherstone. Even the long-gone buildings are referenced in this scheme, with one last vestige conjured by the walled garden set close to Jill. It follows the footprint of a supplementary mill building that disappeared decades ago. Says Featherstone: ‘They were pretty much all over the site. The Sixties house also replaced a whole number of workshops and buildings that supported the windmills.’ The Maughams commissioned a local stonemason to rebuild this wall to create a sheltered garden — ‘and you really do need the shelter’ says Featherstone, given the siting of these mills in an optimally blustery location. Within that framework of conservation balanced with creativity, what emerges is a project that embraces the existing character of the place, intensifies connections across the site and its surroundings, reveals the stories between the buildings and creates a positive setting for the weaving of rich, new narratives.